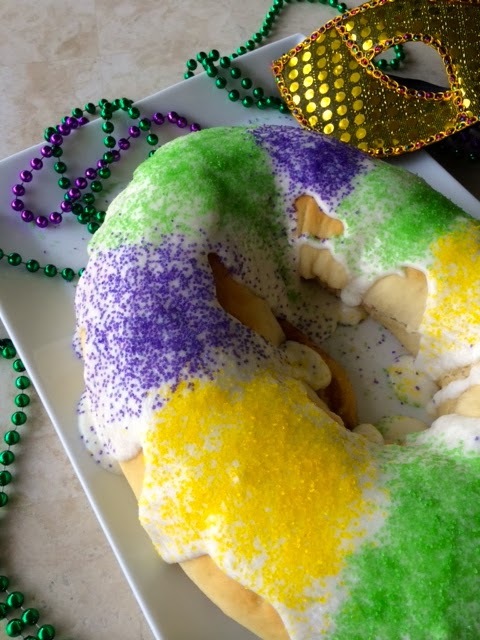 It’s Mardi Gras once again, and this year I decided to not only throw on my beads, but also make a colorful and delicious King Cake! 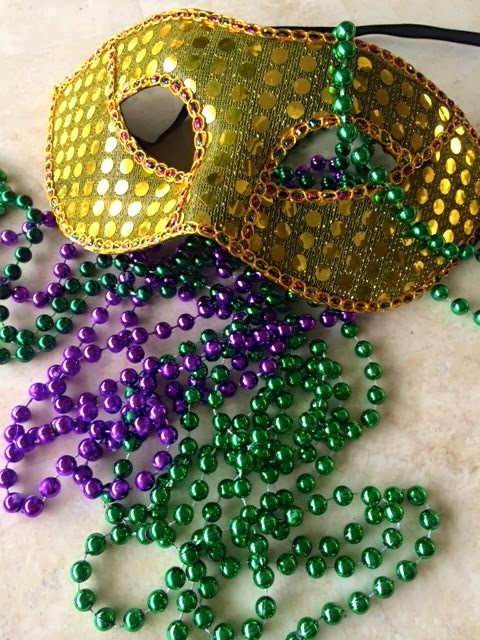 The New Orleans Carnival season starts January 6th, and it’s traditionally part of the winter social season: including King Cake parties, debutante balls and other various parades. 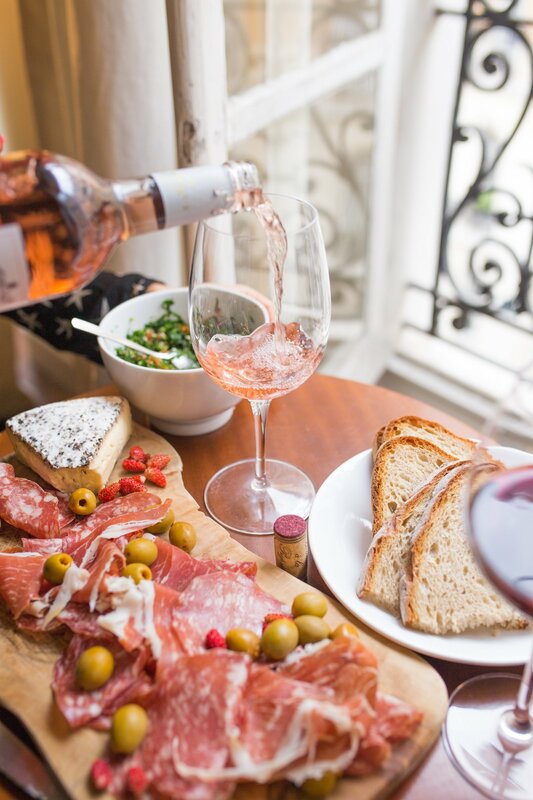 Most of these celebrations take place two weeks prior to Fat Tuesday (Mardi Gras, in French), the day before Ash Wednesday. A small figurine is hidden in the cake and the lucky person that gets that slice is King for the day! 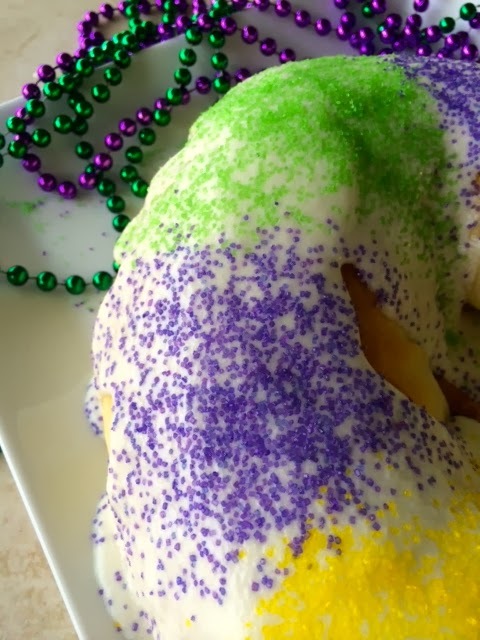 This recipe comes from Southern Living Magazine and is a very traditional recipe for the popular Mardi Gras cake. Stir together yeast, 1/2 cup warm water, and 1 tablespoon sugar in a 1-cup glass measuring cup; let stand 5 minutes. Beat sour cream mixture, yeast mixture, eggs, and 2 cups flour at medium speed with a heavy-duty electric stand mixer until smooth. Reduce speed to low, and gradually add enough remaining flour (4 to 4 1/2 cups) until a soft dough forms. Punch down dough, and divide in half. Roll each portion into a 22- x 12-inch rectangle. Spread 1/3 cup softened butter evenly on each rectangle, leaving a 1-inch border. Stir together 1/2 cup sugar and cinnamon, and sprinkle evenly over butter on each rectangle. Bake at 375° for 14 to 16 minutes or until golden. Slightly cool cakes on pans on wire racks (about 10 minutes). For the glaze: Stir together first 4 ingredients. Stir in 2 tablespoons milk, adding additional milk, 1 teaspoon at a time, until spreading consistency. Drizzle glaze evenly over warm cakes; sprinkle with colored sugars, alternating colors and forming bands. Let cool completely.